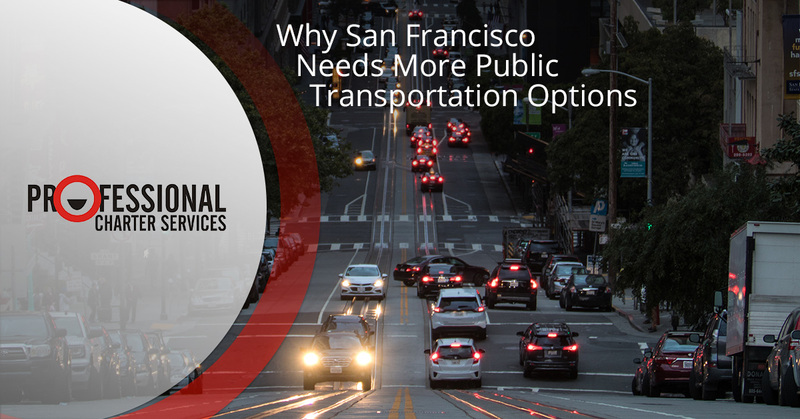 The city of San Francisco offers one of the best-connected public transportation systems in America, but the city is still very car-centric, leading to congestion, traffic, and slowdowns. According to the data shared by FiveThirtyEight, in 2013, people took 131.5 trips per capita on public transportation in San Francisco, putting it second in the nation (after New York City and ahead of Washington, DC). Does San Francisco already possesses sufficient infrastructure to handle the need, or is there room for more options? Our charter bus company thinks that there is still room for the city to grow in the area of public transportation. Cars are great, and we use them, too, but driving into the city can be a headache, and public transportation can alleviate that. Here are some of the reasons why we think that San Francisco still needs more public transportation options. According to the US Census Bureau, the city of San Francisco had a population of 864,816 as of July 2015, while the whole Bay Area is home to approximately 7.68 million people (greater than the size of the entire state of Washington). The population density and growth make the Bay Area an ideal location for an efficient public transportation network, and the more that the numbers of people grow, the more it makes it unattractive to drive individual vehicles everywhere. Speaking of driving individual vehicles, traffic is at an all-time high, and anyone who makes a regular commute to work in San Francisco can probably attest that there is an accident at least somewhere every single day. Backups, congestion, and clogged roads aren’t just bad for your blood pressure and stress level; they’re also bad for the environment and for people’s health. The smog, exhaust, and fumes that are generated by automobiles pollute the air, and according to the national park service, vehicles are the primary source of pollution, outweighing all the other sources of pollution combined. One of the solutions to reduce the number of cars on the road is for companies to offer ride-to-work options, such as a corporate commuter shuttle service, that permits people to meet at a designated location and ride the rest of the way to work together. In a city where there are many affluent people, you wouldn’t think that it would be worth talking about the cost of car ownership, but it is. San Francisco is a city of contrasts, and in the midst of the people with great salaries, there is a 12.3% poverty rate and a huge segment of society who is struggling to make it in one of the highest cost-of-living areas in the country. You don’t have to be one of San Francisco’s homeless to know that purchasing a vehicle and paying for fuel, insurance, parking, tolls, and repairs can make a significant hit to your ability to make ends meet from month to month, especially after your salary has taken a hit from the high cost of housing. There is a large number of teachers, retail salespeople, drivers, cashiers, and house cleaners who need a robust and well-functioning public transportation system so that they have the option to choose not to be saddled with the costs of vehicle ownership. We do our part to alleviate the transportation woes in San Francisco by offering corporate commuter shuttles, intercampus shuttles, and last-mile shuttle services. Contact us today to get a quote and to find out more about how our shuttle service could benefit your company and workforce.